What will the Marico of tomorrow look like? Mumbai: Two years ago, Marico Ltd’s chairman Harsh Mariwala distanced himself from day-to-day operations of the packaged consumer goods maker he founded in 1990, leaving it in the hands of professional managers. Now 65, Mariwala can afford to take a break and focus on strategic investments. Marico is virtually on autopilot mode to becoming a Rs10,000 crore emerging markets multinational by 2020. The maker of Parachute and Saffola oils ended fiscal year 2016 with a profit of Rs725 crore on revenue of Rs6,132 crore. The company already has a presence in 25 countries in Africa and Asia, accounting for 22% of its overall revenue. For future growth, Marico is counting on new launches within its core categories of hair oil and premium edible oils as well as beyond them on the larger platforms of nourishment and male styling in Asia and Africa. The diversification will be guided by its traits of dominating in niche areas and remaining consistent. Among packaged consumer goods companies, Marico has delivered the most consistent organic growth of 17% in sales and 19% in earning per share in 2001-2015, according to a February report by analysts Rakshit Ranjan and Ritesh Vaidya of Ambit Capital Pvt. Ltd.
“The company has built a really solid business over the years and now has solid brand platforms," said Rama Bijapurkar, a management and market research consultant. “The question now is that the platform has a lot of spring and where will you spring and change your pace or growth trajectory." For Marico, not getting disrupted and reliance on innovations seem to be guiding its next leap. So while Mariwala says “we want to be market leaders in whatever we do", and has identified opportunities to move from hair oil to pre- and post-hair washes, skincare and hair fall solutions, and male grooming, the company could also look at acquiring an online brand or even entering into so-called nutraceuticals (food with health benefits) as people get more health-conscious. “The broad spectrum of where we are is tailwind—people want to look good, stay young and be healthy," explained Saugata Gupta, managing director and chief executive officer at Marico. The focus is now on hair nourishment, skin and healthy foods. So for instance, Saffola now stands for much more than just a cooking oil, it is a tailwind category—wellness and its next big driver for growth is in-between meals, or healthy snacking. The company has already gained a leadership position in the savory oats category, with Saffola Oats crossing the Rs100 crore mark in FY16. Likewise, in hair—there are solutions for damaged hair, hair fall and the entire continuum of nourishment—serums and hair oils. “In today’s world you can get disrupted—so how do you innovate and not leave any gaps or segments," said Gupta. The reference is to firms like yoga guru Baba Ramdev’s Patanjali Ayurved Ltd, which has grown rapidly in a short span of time and taken on companies like Colgate-Palmolive India Ltd and Dabur India Ltd as it made inroads into the oral care segment and natural/Ayurveda segments, ending FY16 with revenue of Rs5,000 crore. Patanjali is also in the hair oil market, where Marico needs to protect its turf. The Marico of today gets over a fifth of its revenue from international operations and employs people of nine nationalities, with 39% of its workforce being non-Indian. With its headquarters in the swanky new business district of Bandra Kurla Complex in Mumbai, Marico has come a long way from Masjid Bunder, the heart of Mumbai’s commodity market where Parachute and Saffola were born. Its dependence on the two brands has fallen from 100% in 1990 to about 40-45% of its revenue now. In the next few years it will drop further to about 30% of its overall revenue, said Mariwala, who is keen on catching the shifts in changing consumer habits and also at the same time expanding Marico’s core franchise. “In today’s uncertain world there is this concept of polarity—that is, you have to manage the short term with long term. Manage speed with excellence. Maintain the governance and still remain agile and entrepreneurial," he said, and added: “That is a challenge. A lot of companies are struggling as they haven’t been able to manage the polarity." It wasn’t easy for Marico as well. The firm consolidated its position in India as the largest coconut hair oil brand following the acquisition of Nihar from India’s largest consumer goods company Hindustan Lever Ltd (now Hindustan Unilever Ltd) in 2006. Marico’s international business was about 10% of its overall revenue in FY05 and by FY13 it went up to 22% largely through acquisitions (see Focus on organic growth). In India, it entered the male grooming market and the personal care categories of serums and skin creams with the acquisition of the personal care brands of Paras Pharmaceuticals Ltd from British consumer goods firm Reckitt Benckiser Group Plc in 2012 and also its own launches like Parachute Advansed body lotion. Even as the acquisitions helped the company expand its revenue at a faster pace of 21% between FY05 and FY13, return on capital employed (ROCE) fell from about 50% in FY08 to 24% in FY13. Marico also cut its dividend payout from 52% in FY05 to 21% in FY13 to conserve capital, says author Saurabh Mukherjea in his book The Unusual Billionaires. This triggered a change of guard to bring the focus back on ROCE. “One of the changes we have done in the past three-four years is that we have said that we don’t want acquisitions to be a substitute for organic growth. We are saying ‘please do the organic growth, acquisition is a top-up’," said Gupta. Another change is to focus on doing a few things and doing them well. So in 2011, Marico divested Sweekar, an edible oil brand; in 2013, the company exited from the rice segment which it had launched under brand name Saffola Arise in 2010. Marico also restructured its operations. In 2013, it demerged its loss-making beauty and wellness chain Kaya into a separate company called Kaya Ltd. It merged its international and domestic operations and put Gupta in the driver’s seat. “Kaya is a complex business because it is a combination of three different businesses—retail, hospitality, medical business," said Mariwala. Kaya’s India business performance has not been up to the mark while its international business is doing much better, according to Mariwala. “There is a need to fix the India business," he said. It is this trait of not pulling back, of allowing for time to achieve success that differentiates an entrepreneur from an investor. “In today’s world people feel that innovation is only done by start-ups. But here you have an organization whose business strategy is driven by the values of the founder. So even though there is a professional management at the helm, the culture of innovation and the belief that you can’t win unless you try remains," said B.S. Nagesh, an independent director on the Marico board since 2010. Nagesh is founder of TRRAIN—Trust for Retailers and Retail Associates of India—and also the non-executive vice-chairman of Shoppers Stop Ltd.
As it scales up, Marico is now also placing smaller bets outside of the company on other entrepreneurs. The strategic investment in beauty salon firm Bellezimo Professionale Products Pvt. Ltd, a joint venture in which it picked up a 45% stake last year, is one such bet. “We are looking at more such spaces: it could be anything from nutraceuticals, to digital brand and analytics firm," said Gupta, adding that the company would look at potential Rs100 crore opportunities and introduce variants of existing brands on the lines of Parachute Advansed body lotion and Saffola Oats. The company can’t afford to pause. “The initial entrepreneurship that it has shown has now been restrained," said Abraham Koshy, a professor of marketing at Indian Institute of Management, Ahmedabad, explaining that Marico’s initial aggression has now shifted to pursuing an incremental growth whereas there is far greater scope to redefine the market, like Patanjali has shown. “They should take inspiration from that," said Koshy. The last two years have been challenging for India’s consumer packaged goods industry as two years of drought took their toll on rural spending. Urban spending was not able to pick up the slack, causing the sector’s growth to slow. “For now we have to move to 10% volume growth, currently we are hovering at 7-8%," said Gupta. The management’s incentive structure is tied to long-term growth drivers and the company always invests behind the brands in protecting and/or expanding their market share, he said. About 95% of products in Marico’s portfolio are No. 1 or No. 2 in their categories, according to its annual report for FY16. Volume growth is an important measure for the consumer packaged goods industry; low penetration gives companies plenty of room to generate sales by selling more units to existing and new consumers. Also, the outlook for inflation is 3-4%, lower than the historical 6%. “We have now entered an era where perhaps the inflation will be lower," said Gupta. If Marico wants to grow 15-20% a year, it will have to work harder to expand its sales volumes given that value growth led by inflation is likely to be lower. To be sure, low food inflation is good for the sector as food competes with consumer packaged goods in the overall consumption basket. High food inflation dents consumer spending on packaged goods. The consumption cycle is yet to turn the corner, although companies are hoping ample monsoon rains and pay hikes to government employees will change that. Moreover, low inflation helps consumer goods companies lower input costs. All the same the packaged consumer goods sector’s performance has been mixed over the past three years. Revenues of 12 listed entities including Marico, Hindustan Unilever, Godrej Consumer Products Ltd, Emami Ltd and Dabur India grew at a slow 8.34% compound annual growth rate (CAGR); the sector’s operating profit margin expanded 270 basis points to 23.79% at end-March 2016 from 21.09% at end-March 2013 aided by lower input costs. Likewise Marico’s CAGR for revenues for the same period was higher at 10.09%. However operating profit margin expansion was lower than its peers at 18.3%. This is also reflected in its stock performance. Marico has fared better than its peers. Among the shares of consumer goods companies, Marico outperformed the industry leader. While shares of Hindustan Unilever gained 19.02% to Rs926.60 on Friday from a 52-week low of Rs766.40, Marico’s shares gained 56.21% to Rs295.70 from a 52-week low of Rs189.30. Peers Godrej Consumer Products’ shares gained 50.59% to Rs1,684.85 from a 52-week low of Rs1,118.80 and Dabur India shares gained 26.59% to Rs292.80 from a 52-week low of Rs231.30. 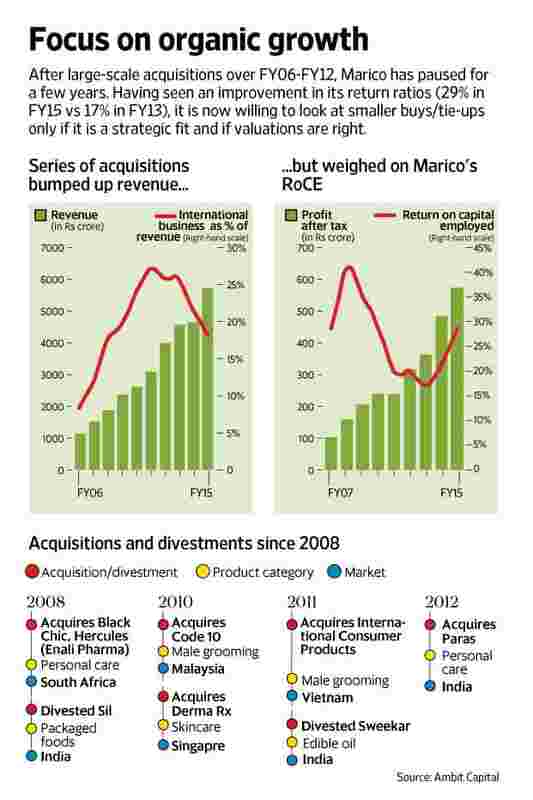 Still, Marico needs to step on the gas to boost growth. Domestic growth will be led both by the core brands of Parachute and Saffola as well as new brands to deliver 10% volume growth. “For the next 9-10 years, Parachute can give us a 5-7% volume growth. Saffola can grow at 10-12% for the next five-seven years and the rest of the business has to grow at 15% for the business to deliver 10% growth," said Gupta. Ambit Capital estimates that Marico’s consolidated sales will expand at a CAGR of 16% from FY16 to FY20. This will be driven by domestic operations growing at a CAGR of 17% and international business at 15%. For Marico, it’s time to get back on the treadmill.